Students explore the concept of concentration by investigating acids and bases. An investigation into hydrogen ion concentration using the pH scale is part of this CELL. Also, the effect of dilution of an acid on the pH, and the effect of neutralizing an acid with a base on the hydrogen ion concentration and the pH are further concepts explored. Recognize acids and bases as household chemical compounds and realize that they are not necessarily strong or dangerous. 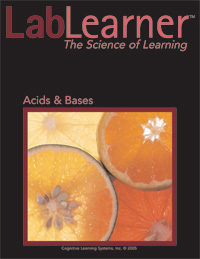 Determine the pH of different chemical compounds and categorize them as acids or bases. Investigate how the difference between acids and bases correlates to the difference in hydrogen ion concentration of solutions of the two classes of compounds. Introduce the concept of solute concentration. Dilute an acid to prepare more dilute concentrations of hydrogen ions. Measure the change in pH when an acid is diluted. Learn to correlate a low pH with a high hydrogen ion concentration and a high pH with a low hydrogen ion concentration. Perform a neutralization reaction by mixing an acid and a base. Determine the extent of a neutralization reaction by measuring the pH of the reaction. Observe that in a neutralization reaction, a base decreases the concentration of hydrogen ions, resulting in an increase in pH.